In Atlanta this Wednesday? 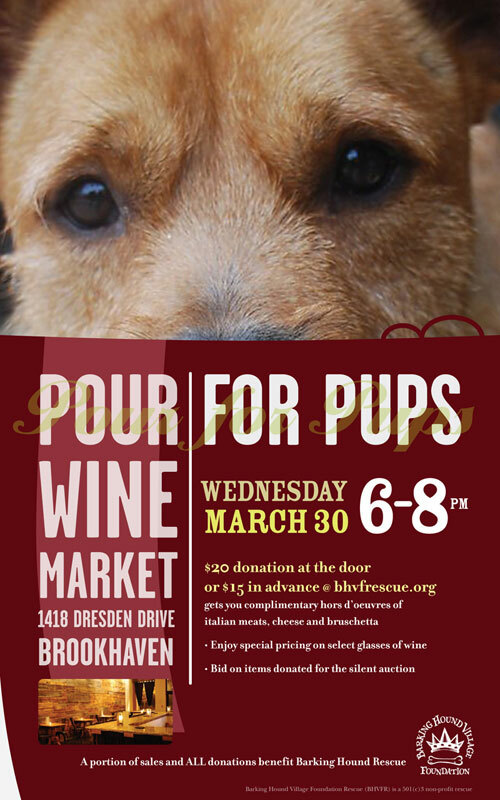 Join us at Pour for Pups Wednesday, March 30th from 6 - 8 p.m., at the Pour Wine Market in the Brookhaven neighborhood of Atlanta. Help the pups who need it most and have a good time too! Buy your tickets in advance via pay pal for $15.00, or make a $20 donation at the door. Please bring your confirmation email with you to the event. A barking good time at a cool, new wine bar! Pour Wine Market is located at 1418 Dredsden Drive in Brookhaven, Atlanta. BHVF rescues approx. 50-100 dogs each month from high-kill shelters, gives them medical treatment and love and transports them to other no-kill shelters. Spread the word and come out to help Pour for the Pups! And remember the more you eat and drink, the more pups will be helped! A portion of sales and ALL donations will benefit Barking Hound Rescue. in comme il faut a line when it comes to different users.